This is a sponsored post. This post is brought to you by Hidden Valley® Original Ranch® and SheKnows Media. I want to introduce you to my new favorite salad: Southwestern Chopped Salad, loaded with tons of veggies, juicy and flavorful chicken, and topped off with Buttermilk Ranch Dressing (Hidden Valley® Original Ranch® brand)! It’s a salad, side dish, and dinner all in one – depends on how hungry you are! And so easy-to-make – only 30 minutes from start to finish: just chop up all the veggies, cook the chicken in Mexican-style spices, and spice everything up with a delicious dressing! Super flavorful, colorful, healthy, this recipe is packed with fiber (vegetables) and protein (chicken)! And did I say it is gluten free?! 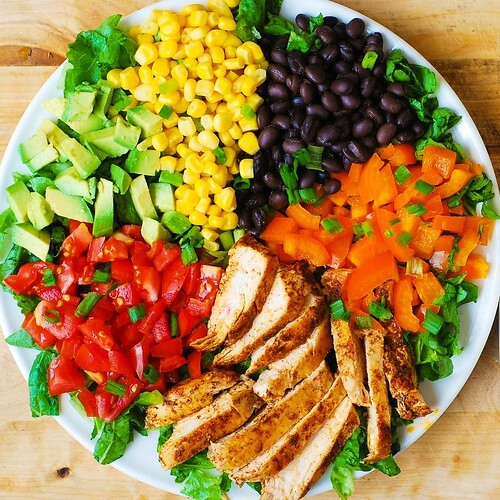 You’ll love this salad! What’s even better, your kids will love it too, especially when they taste the dressing! What a great and easy way to serve tons of veggies to your kids. We all know that the best and easiest way to take the salad from boring to flavorful is the right dressing! In this recipe I am using Hidden Valley® Buttermilk Ranch – and it’s not called America’s Favorite Ranch for nothing! It’s delicious, versatile, and makes everything taste better: the vegetables and the chicken! Add the Mexican-style spices, and you’ll have one of the most delicious (and healthy!) meals you’ve ever tried! I love how colorful the vegetables are in this recipe! Colored vegetables are so good for you – they are packed with a variety of essential nutrients. I love the Buttermilk flavor, and the Original Ranch dressing will work great here too! By the way, did you know that both Hidden Valley® Buttermilk Ranch dressings are gluten free?! It’s always a huge plus in my book since I HAVE to follow a gluten free diet. I very much respect the companies that take the time and effort to ensure their products are gluten free and label them as such. It makes life so much easier for us gluten-free folks. One thing less to think about! Make sure lettuce, bell pepper, tomatoes, avocado, and green onions are all finely chopped. Rinse and drain canned black beans and canned corn. Add all salad ingredients, 1.5 teaspoon of ground cumin, and 1.5 teaspoon of chili powder to a large bowl and toss with the desired amount of Buttermilk Ranch dressing. Taste the salad, and definitely add some salt, to taste. Adding just the right amount of salt at this point will really bring out all the flavors! Top each salad serving with cooked chicken (cubed or sliced into stripes). What winning salad do you make with Hidden Valley® Original Ranch®? LEAVE A NOTE IN THE COMMENTS FOR A CHANCE TO WIN A $100 VISA GIFT CARD! I made this for dinner last night and it was so tasty!! Super easy as well. I paired it with the hidden valley cilantro lime ranch dressing and it went so well! My first time trying this and it tasted as if an expert made it. My husband loves it. Thank you! Thank you so much for such a sweet comment! I am glad you liked the salad! Love how easy it is to make it and loved the flavor of all these ingredients. Although I cant get the dressing that you have, it still tasted very nice with garlic sauce. This salad was great! I used paprika on the chicken instead of cumin. I made this tonight for supper because I always make a healthy salad to along to along side our Dinner. I decided to just this because it had chicken it. GOODNESS, IT WAS DELICIOUS and so satisfying it will be on our daily at least once a week. I cannot thank you enough for wonderful recipe. I have had 7 heart surgeries and almost passed away twice so I am so concious about clean eating and eating for me and my family. I’m turning 49 this August and I’m grateful for each day and such wonderful healthy pins for such good food on my strict diet. Ty again! Cathy, so glad you liked this recipe! And so nice to meet people, even if virtually, who appreciate their lives and value each day and each moment. I am wishing you all the best! I would say if it’s for dinner – 4 servings, if it’s lunch or snack – 8 servings. It looks absolutely delicious! Add thousand island sauce if you want more flavor. Great work!